Have you heard of barre workouts? Did you know you can easily do them at home? Well, people who are keen on these exercises state that they leave them feeling stronger, more energetic and more flexible. They also assert that they have seen significant changes in their cores and most importantly, sculpt of their booties! With all these benefits in tow, one may wonder if barre workouts are anything but another hype on the market, especially for people who are into high-intensity exercises. Barre workouts are unlike most of the workouts that you will find in gym classes across the globe. For one, the movements are quite slow and controlled, and they exude grace and confidence, unlike most workouts where the aim is to have people dripping in sweat with each minute that passes. Based on information on The Home Dweller website, barre workouts are a combination of pilates with ballet and some cardio, thus resulting in the sculpting of bodies which makes devotees look toned and lean, much like what you would expect of a dancer. The impressive thing is that these exercises can strain even those who are into high-cardio workouts as the controlled movements tend to be harder to master than even burpees! If you end up shaking as you try to get a grip of the bar while controlling the direction of your legs, know that it is all part of the learning curve. Why would anyone consider a barre workout? The good thing about these exercises is that they work, even for people who are known to have two left feet. Yes, you don‘t need to be into choreography. As long as you are willing to learn, there is much in store for you, and you can move through each level as you get deeper into the workings of ballet. And the risk of injury is low, so you don‘t have to worry about that. Besides, most of the workout involves stretching. Most of the work you do will target your core and will thus strengthen it. Have you been dreaming of abs that will have people turning their heads in awe in summer? Well, here is a simple way to get that toned look. And the great thing about it is that your posture also gets better with time. With the stretching exercises in play ranging from twists to splits, you are sure to notice a significant change in your flexibility. Thus, if you want to touch your toes and are unable to at the moment, you may have found the answer to your problem! Other than these benefits, these workouts also make you stronger, and they help you lose weight over time. And the icing on the cake is that they are not dull, thanks to the versatility in movements. The more time that you spend practicing ballet, the higher better your posture will be, over time. And you cannot rely on what you get in a class alone, but rather, you need to create avenues where you can perfect your skills. One way of doing so is by having a ballet barre at home or studio. This move will enable you to catch up on what you did not in class as you dance your way to tip-top shape. You can make a wall-mounted ballet barre, or you can opt to have a portable one, based on what you like best. Let’s take a look at a simple guide on making the first option. The first step lies in knowing what height you would like for your barre. It could be what you use in class or other measurements which you feel will work for what you would want to practice. It is essential to have prior knowledge of what can work for you to prevent problems later on. "Measure 100 times, cut once"
Take a tape measure and mark the height that you would like on the wall using a pencil. Move along the tape measure as you make markings for the brackets that you will place at a later stage. Ideally, you have two options at this stage. You can opt to start the marking at the middle of the ballet barre, or you can have it at the end. Again, this will all depend on what you would like to get out of the ballet barre. When it comes to the purchase of brackets, you want to choose something that can work for the wall. Anything that works on closet rods or stairways will do. You can consult with the people at the hardware store, to help you in choosing something that is not only stable but also functional for the intended use. If you want to get a really good set of brackets, this is the bar we would recommend to our family and friends. Its called the Vita Vibe Single Bar, and it is fully wall mountable, and won't break the bank. Ideally, the barre height should be at the level of your waist. However, that is not the only way to go about it. Some people opt to go with the standard thirty-two to forty-six inches from the floor, and this works just as well. Now, here is another thing that you need to consider when choosing the ideal height: the bracket spacing. You see, the brackets will be under the barre such that they will influence how high it will be. As such, you should consider such allowances when making the markings. With this marking out of the way, the next step lies in locating the placement of studs in the wall. You have three options in this case. In the first one, you can use an electronic stud finder which will significantly ease the process. The second option involves the use of wall outlets and other such features in the location. The last option is the use of sixteen-inch increments from the wall. Some people place their barres without following through with this step, and their construction goes well. However, it is always best to take caution to avoid hitting anything that could threaten the integrity of the ballet barre. Now it is time to measure the distance of the brackets as well as to make the appropriate markings for the same. Here, it is up to you to decide where you would like your brackets so you can have fun with the construction as long as it results in a stable structure. You need to ensure that the brackets are all at the same height and you can easily do so through the use of a level. The length of your ballet barre will ultimately affect the number of brackets that you need to use as well as the spacing for the same. Take an example of a case where you wish to have a four-foot ballet barre. Here, you would require to have two brackets which you would space thirty-two inches apart, ensuring that there is an eight-inch overhang in place. An eight-foot barre would need twice of these measurements. For a six foot barre, you would require a spacing of forty-eight inches, coupled with a twelve-inch overhang, while for a ten-foot barre, you would need an eighty-inch spacing with a twenty-inch overhang. You can play about with these measurements to figure out what would work best in your case. The bigger the barre, the more the work in store for you will be. 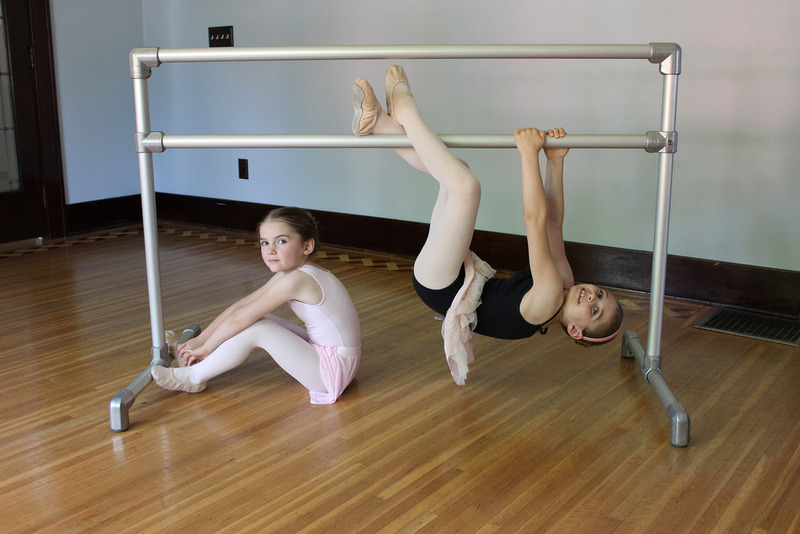 Take an example of a sixteen-foot barre. Here, you would need three brackets. One of the brackets would require centering with a spacing of eighty inches on either side, coupled with a sixteen-inch overhang. Once the markings are in place, everything else will fall into place with ease. All that matters is that they are all level and the structure should hold for all your practice sessions. You will need a power drill to place the brackets on the wall. The type, as well as the size of your brackets, will affect the number of screws you will need for the process. You will need a screw with which to attach the bracket to the wall as well as another which you will use to connect the same to the dowel. You will need to make markings on the dowel, ensuring that they are like those on the wall. You can then make holes in the dowel which you will use to attach the brackets. If you are new at DIY, it helps to attach the brackets to the dowel before moving the structure to the wall. Also, having people to help you with the leveling and the markings will make the process much more manageable. In the end, you should have a steady ballet barre, ready for use. All the best! Author’s bio: Born in 1971, in Farmington, MI, Jessica grew up in a warm family environment. Her father is an Electrical Engineer and Inventor, and her mother is a Veterinarian, with two siblings and a very large backyard. Jessica runs her own blog where she writes about different home appliances. Previous Post The 12 Best Body Lotions for Men: Great Smelling Moisturizing Creams Next Post How To Get Stronger At Pull-Ups?